Nothing says comfort food like cheese and potatoes. It makes you feel good inside just thinking about it. Comfort foods are a year round favorite. This cheese and potato casserole is a great addition to a potluck dinner, a special occasion or just dinner any day of the week. You don’t need an excuse to make it. 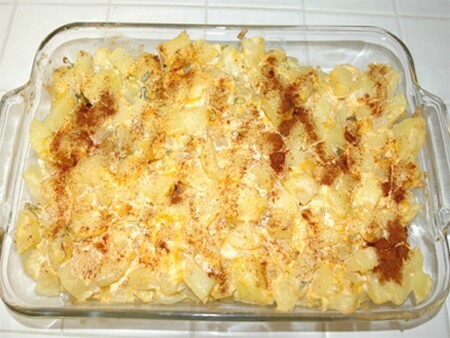 The cheesy potato casserole is simple and easy to make. It’s sure to be a family favorite and a crowd pleaser. Here is how to make cheesy potato casserole. Prepare your workspace with all of the things you will need. All of the food ingredients above need to be accessible: Hash browns, plain potato chips, potato soup, shredded cheese and the stick of butter. Place all of your kitchen ware and utensils in a convenient place. You will need your can opener, large bowl, cake pan and small bowl. Turn your oven on to preheat at 325 degrees. Place the 2 lbs of hash browns in the large bowl. Next, add your bag of shredded cheese. You can choose to have cheddar cheese, which always works well, or you can jazz it up by using a multi cheese blend. After the cheese is added, pour in the can of potato soup. Top the mixture with the 16 ox container of sour cream. Mix these ingredients. Make sure the ingredients are evenly distributed through out the mixture. Pour you casserole mixture into the cake pan. Give the mixture a second look to make sure all of the ingredients are well incorporated and evenly distributed. In your small bowl, you will need to add the stick of butter. Place the small bowl with the butter in the microwave. Melt the butter for 1-2 minutes. You want the butter to be completely melted and in liquid form. Now, you need to prepare your potato chip topping. Crush your plain potato chips inside the bag. Crush the chips to a medium or slightly smaller size. You don’t want the potato chips to be too large. 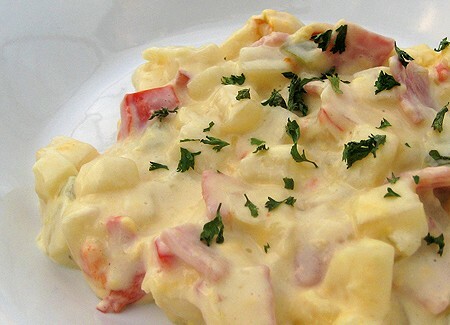 Top the cheesy potato casserole mixture with the crushed plain potato chips. Place the topped casserole in the over. Bake the cheesy potato casseerole for one hour. The casserole is done when the hash browns are tender. Serve the cheesy potato casserole while it is hot.